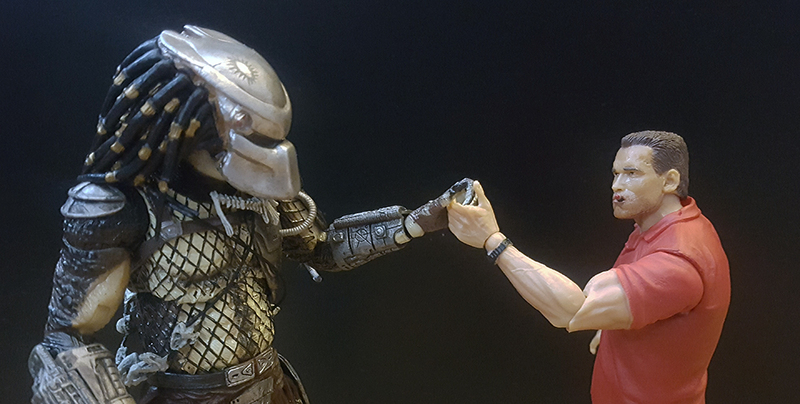 Posted by David Boyce in NECA, Predator, Review with 0 comments. Thirty years ago on June 12th, 1987. Hollywood, NAY, the world would never be the same. A small group of people went into the lush wilderness only to come upon a horrifying monster played by a behemoth of a man: Kevin Peter Hall. The film he starred in forever changed the cinematic landscape as we know it. I’m of course talking about the modern classic: Harry and the Hendersons. Harry and the Hendersons is a coming of age, family comedy, Bigfoot spectacular starring the aforementioned Mr. Hall, John Lithgow, and a bunch of jabronies that I never saw again. Lithgow and his family are driving home from a camping trip in Seattle where he is talking to his nerd son about shooting animals, constantly being blinded by the sun, and refusing to adjust to the situation while doing hairpin turns at seventy miles per hour. I’m not kidding, he drives like he played way too much Burnout Paradise. So, while being stubbornly blinded by the sun they hit something with their big ol’ beautiful wooden-paneled station wagon. As it turns out, it was a Sasquatch, and they thought he was dead so logically they bring his alleged corpse back home. From there, they find out that the Bigfoot, which they dubbed as ‘Harry’, is alive, and the family goes through an emotional roller coaster as they must get him home while avoiding Bigfoot hunters, respecting mother nature and her creatures, and learning the true power of love. I guess. This became a television series somehow, and managed to get 70-some episodes. Oh right! The movie Predator, also starring Kevin Peter Hall, was playing that weekend which is a pretty neat little gem. Remember what I said about the Ghost Predator from series 16 looking an awful lot like Jungle Hunter? Well do ho ho, I was correct! So if you already have him, you basically know what to expect sculpt-wise. This is the third version of the Jungle Hunter that NECA released. It’s the usual standard ‘Ultimate’ Predator figure: upgraded articulation, a better paint job, and a plethora of accessories. Similar to the Ultimate City Hunter, Jungle Hunter comes with a few items from the Predator accessory pack: two skulls and a blue energy blast. Rounding out the accessories are two heads (masked and unmasked), two sets of hands (opened and closed), the plasma caster, and an extra mask to recreate that scene where Harry from Harry and the Hendersons takes off his mask in dramatic fashion, and then fights John Lithgow to the death in South America. The Ghost Predator has proven that with a removable mask the head still seems a little too big to look accurate, so this is a nice workaround. Overall, it’s another Predator. But Jungle Hunter is THE Predator, and is a good upgrade to the previous offerings. Especially the first one which had a V-crotch, yuck. I wish they gave him a third head that was screaming, but they are releasing a version of that for the 30th Anniversary wave along with the Jungle Disguise, Film Prototype, and four re-releases of Dutch figures if you missed out on those. Personally, I’d recommend the Jungle Disguise/mud version as that figure is the best out of the bunch and compliments Jungle Hunter the most if you chose to recreate the final fight scene. The Predator Ultimate Jungle Hunter can be purchased at Amazon. David Boyce has a YouTube channel where he infrequently makes bad decisions with food and or music. He also has a podcast called “The Clouded Judgement” Podcast where they look back to see if things in pop culture actually hold up.